Hyderabad-based Edgefx Technologies Pvt Ltd, which provides do-it-yourself project kits for engineering students, has raised an undisclosed amount in a bridge round from a clutch of investors, a top company executive told VCCircle. According to Kamini Gupta, founder and CEO, Edgefx, international angel network Cross Border Angels & Experts, Rajasthan Angel Innovators Network and The Chennai Angels participated in this round. “The funds raised will primarily be used for international expansion, besides upgrading the company’s product portfolio, and making crucial hires in marketing,” Gupta said. Mandar Gadkari, head for Asia-Pacific, West Asia and Africa at Cross Border Angels & Experts, said that Edgefx products not only have a global market, but also address a critical problem of skill-building in students. Edgefx is also looking to raise some more money, probably as an extension of the ongoing round, for product development. “Subsequently, we will hit the market for a Series A round in 12-14 months,” Gupta added. In March, VCCircle had reported that Edgefx was part of eight startups that had received funding commitment from Cross Border Angel and Experts as part of the Startup India Rocks initiative, the investment network’s annual conference held at Bengaluru. Founded in 2011 by Gupta and Anil Kanodia, Edgefx designs, manufactures and sells do-it-yourself educational kits for science, technology, engineering and maths. Students can select generic kits from over 40 broad different categories, including electronics, electrical, embedded, communication, AI, IoT and Arduino. The company also offers customised solution to address students’ requirements. 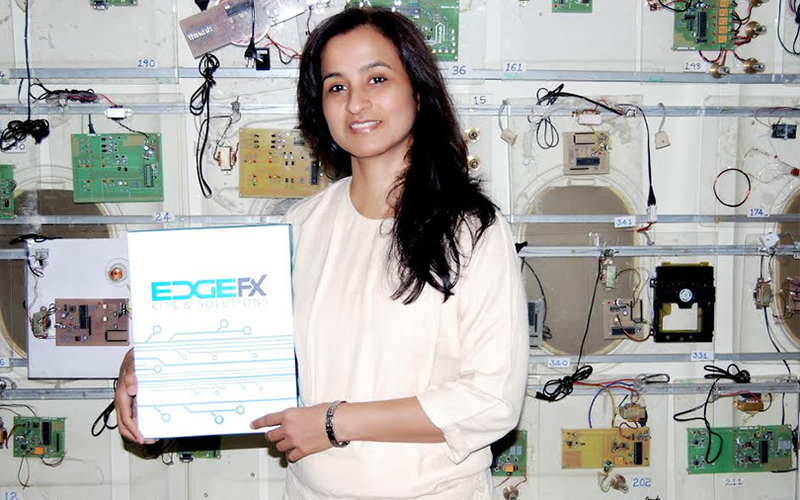 Edgefx Do It Yourself Project Kit, the flagship product, has been a hit with final-year engineering students, says Gupta. The kits comprising hardware, software, firmware, audio-visuals and other learning material cost anywhere between Rs 1,599 and Rs 50,000. According to Gupta, the average ticket size of the purchase on its Indian site is Rs 8,000, while the international website clocks $200-217 on every transaction. The company started generating revenue from 2013 onward and has so far recorded $1.3 million. Gupta said the company is profitable with net profit margin of 15-16%. Though the company is yet to make a formal entry into international markets, its products are already being used by students in the US, the UK, the UAE, Singapore and Malaysia. International markets account for a quarter of its total revenue with the US making up 60% of its overseas revenue. It will tie up with seller and distribution partners for its formal international expansion. A computer science engineer, Gupta has over 15 years of experience in training engineering students, and was earlier associated with Orbit Technology Pvt. Ltd, a company that trained professionals in the IT, multimedia and hospitality training industry. Co-founder Kanodia is an MTech and was the chairman at Orbit. “I see huge growth potential for the company not only across schools and colleges in India, but across all third-world countries,” said Mahavir Sharma, co-founder, Rajasthan Angel Innovators Network. Recently, Edgefx had launched two products – Edgefx Beginner's Engineering STEM kit, which caters to first- and second-year engineering students, while Edgefx School STEM kits for high school students. The company is developing a smart block-based technology for children in the age group of 8-12 years. “The idea is to help children understand the simple basics of electronics at an early age, along the lines of a ‘lego for electronics’,” Gupta explained. Other recent deals in the ed-tech space include an undisclosed amount in a seed round by Jaipur-based education management portal, eShiksa, from Cross Border Angels and Rajasthan Angels. Pvt. Ltd’s received an undisclosed amount in angel funding. space, had raised an undisclosed amount from Belgian family office Verlinvest. The company has raised more than $170 million till date in external funding.